We had been on the Shinkansen train from Tokyo for about four and a half hours when Tara saw this gorgeous castle right next to the station we were stopping at. After some hesitation, Seth made the decision to hop off the train to see the castle instead of continuing to Hiroshima. It was a great decision. The castle was beautiful. 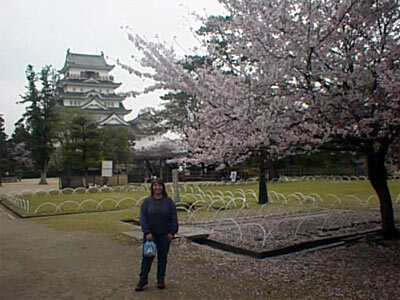 It was in the same style as the castle we'd seen the day before in Hirosaki. However, the castle here in Fukuyama was much larger. The castle here was also surrounded by cherry trees in bloom, unlike the castle in the far North where the blossums had not come out yet. We were maybe one or two days too late to see the cherry trees in full bloom, but they were still gorgeous. There were still many people "picnicing" under the blossums and cute lanterns were strung between the trees. Tara wanted to climb up the castle steps so that she could see the surrounding countryside view from the castle's balcony. However, it was just before the castle's 5pm closing time, so we were not allowed inside. It didn't matter at all since we enjoyed walking all the way around the castle. We settled into a bench and watched the castle, the people, the pigeons and the cat. The cat stalking the pigeons was a bit unnerving, but none of the pigeons seemed to mind. The cat finally got bored and walked off. We offered to take a photo of three other foreigners and ended up talking to them for a while. They were a friendly English family from near Brighton. The son was in the JET program teaching English at nearby junior high school and his parents were in town visiting for two weeks. We walked around some more and took more pictures. We decided that Japan is one of the more picturesque places we've visited since we're constantly taking pictures. Finally we said good-bye to the castle garden and headed out to the station. We took a different route from where we entered and were happy to find numerous little food stands. There were only two open stands. One served taco (aka Octopus) and one served corn. Tara bought the corn. As we waited for Tara's corn to be grilled, we noticed that the lady cooking up the taco was smoking a cigarette. It fondly reminded us of our favorite "dirty gyoza" Ramen shop in Ebisu where the night cook was always smoking while chopping up vegetables! The train station again smelled delicious when we returned and this time we decided to track down the smell since we had half an hour before the next Shinkansen train left for Hiroshima. We found the good smell easily. It was coming from a small bakery selling cream puffs. They were obviously very popular since approximately fifteen people were standing in line waiting to buy them. We queued up and started to wait. A man came up to us while we were in line and tried to tell us something that Tara just could not understand. She thought he was telling us that the creme puffs they were serving now were not fresh and that fresh ones would be out in 30 minutes. He offered us one of his and we declined. Finally, we figured out what he was saying when the line stopped moving since the store had run out of creme puffs. More were coming out of the oven in 10 minutes though, so we decided to wait. We enjoyed watching the young, female cooks "fan off" the puffs when they came out of the oven. However, we didn't know if we were going to make or miss our train by the time we got to the front of the line. Luckily, with our five cream puffs under arm, we ran and were able to catch the train at :27 after! Our train for the last half hour of our trip was very different from the train we'd been on earlier in the day. This train's green car was a double-decker car and all the seats were equiped with TVs! Accommodation N/A Only a couple of hour stopover. Leave Tokyo at 1:07pm and scheduled to arrive Hiroshima at 4:58pm. But, we jumped off at Fukuyama at 4:27pm and reboarded another Shinkansen two hours later at 6:27pm arriving Hiroshima at 6:58pm.